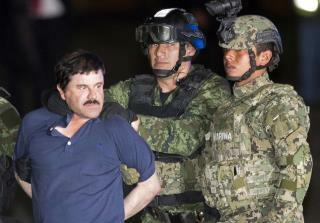 (Newser) – In an exclusive interview the New York Daily News calls "astounding," the daughter of infamous Mexican drug lord El Chapo tells the Guardian her father snuck into the US twice while on the lam from authorities following a jail break last year. It's the first-ever interview given by Rosa Isela Guzmán Ortiz. She says her father, Joaquín "El Chapo" Guzmán, made it across the border undetected twice in late 2015 to see the five-bedroom home he bought for her and her children in California and to visit relatives. Guzmán Ortiz wouldn't or couldn't say how her father made it across the border. “I asked him the same, believe me," she says. Guzmán Ortiz, who runs a string of businesses in California, and El Chapo's third wife are both US citizens. Kinda stupid to have your faces and name showing; giving who you are dealing with.